The adjective simply refers to the fact that the outcome variable is related to a single predictor. The slope of the fitted line is equal to the correlation between y and x corrected by the ratio of standard deviations of these variables. The intercept of the fitted line is such that it passes through the center of mass (x, y) of the data points. Other regression methods besides the simple ordinary least squares (OLS) also exist (see linear regression). In particular, when one wants to do regression by eye, one usually tends to draw a slightly steeper line, closer to the one produced by the total least squares method. This occurs because it is more natural for one's mind to consider the orthogonal distances from the observations to the regression line, rather than the vertical ones as OLS method does. Linear regression can serve as a useful forecasting tool within the limits of linearity. For non-linear data, accuracy will suffer when using linear regression. 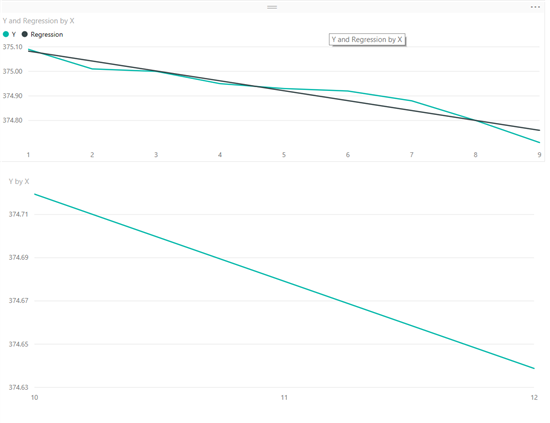 In Power BI Desktop, import both CSV files into the model as "regression" and "estimation" tables. There should be no relationship between these tables. You can now plot your original values and the linear regression estimation values (Estimate) as well as plot your X values for estimation and the linear regression estimates (Estimate). Below is a screen shot of example data. The first graph shows the original values plotted with the estimates derived from linear regression. The graph below that shows estimated values for desired future values of X.